Homemade bread… adds a little warmth to the coldest winter day . Yay, it is finally March. You just don’t know how tired I am of winter. Wearing layers of clothes, freezing fingers on the way to work, freezing all day at work no matter how many layers you wear… I know that I shouldn’t complain, since I chose to live in Minnesota. But, really does it have to be so cold for this long?!? I can’t wait until all the white outside is replaced with some color… like green. Really enough is enough. Well one thing good about the cold is that it is the perfect time to spend in the kitchen making things like bread. Yeah, I love the smell of fresh bread baking in the oven when it is cold outside. It makes even the coldest days just a bit brighter. What makes fresh baked bread even better? It is when you don’t have to wait all day before you stick it in the oven to bake. That is one of the hardest things when baking homemade bread is the waiting and waiting. 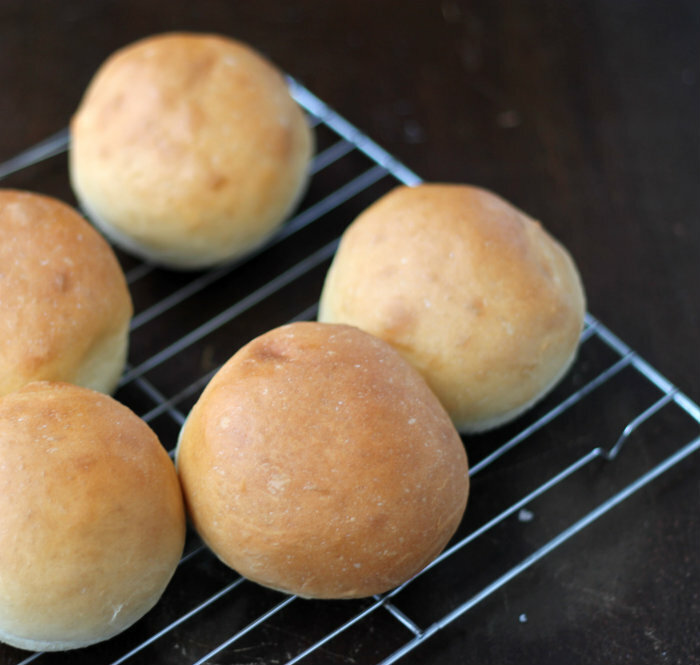 The recipe that I am featuring today will have bread on the table a bit faster than some of those other recipes. 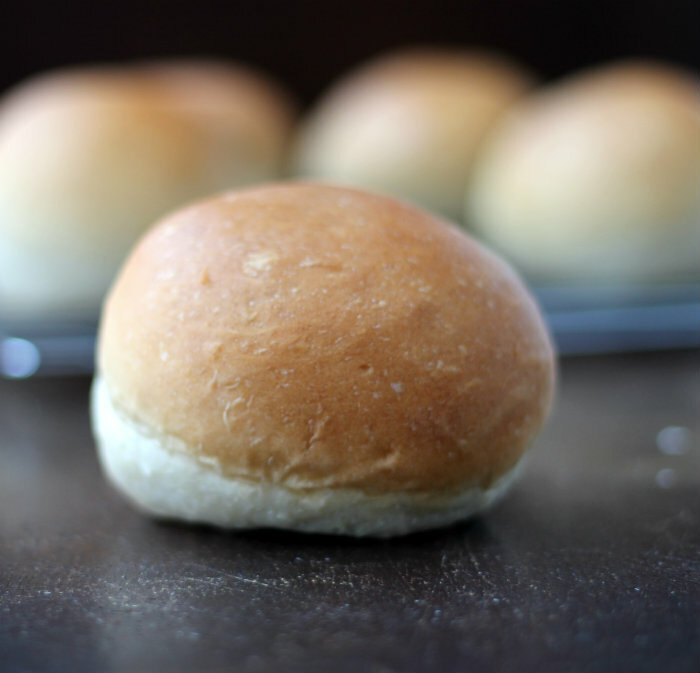 It’s perfect to serve as a bun with your favorite hamburger or favorite meat or just as a dinner roll bun. When I made them I served them with a BBQ pulled pork, but some of the family ate them with butter. Perfect either way. In a large bowl combine 2 cups of flour, yeast, sugar, and salt. In a microwave bowl combine the milk and water and heat until warm (about 120 degrees F). Add the warm milk mixture and the olive oil to the flour mixture, stir with a wooden spoon until well blended. Add the egg and blend in. Gradually add the rest of the flour one cup at a time, mixing by hand. Continue to knead the bread until enough flour is worked in so the dough is just slightly sticky to your touch and the dough is smooth. Grease the bottom of the bowl and turn to coat both sides. Cover and let rise in a warm place (I like to put a little warm water in my kitchen sink and then set the bowl in the water to help it rise faster) for 30 minutes or until double. Once the dough is double in size form into buns and place on greased baking sheet. Let the buns rest for 15 minutes and place in preheat oven. Bake for 12 to 15 minutes or until golden brown. Spring is almost over here…and I am so happy! There’s nothing quite like the homemade bread.. Your burger buns are so soft and delicious. Perfect buns! Wonderful for burgers, sandwiches and just to eat as they are!!! Your hamburger buns turned out perfectly! I make a very similar version and love that they can be ready pretty quickly. There’s nothing like homemade bread. Burgers are one of those meals that our whole family can agree on, we all love them. Can’t imagine how happy they’d be if I made the buns myself too. And I love your hint about the warm water in the sink. I’ll definitely try that. The cold is starting to get to me too, and I really should take up bread baking as a coping mechanism! These little buns look so good! Winter has been a killer the last few weeks, hasn’t it? I’ll be glad to see it gone, too. 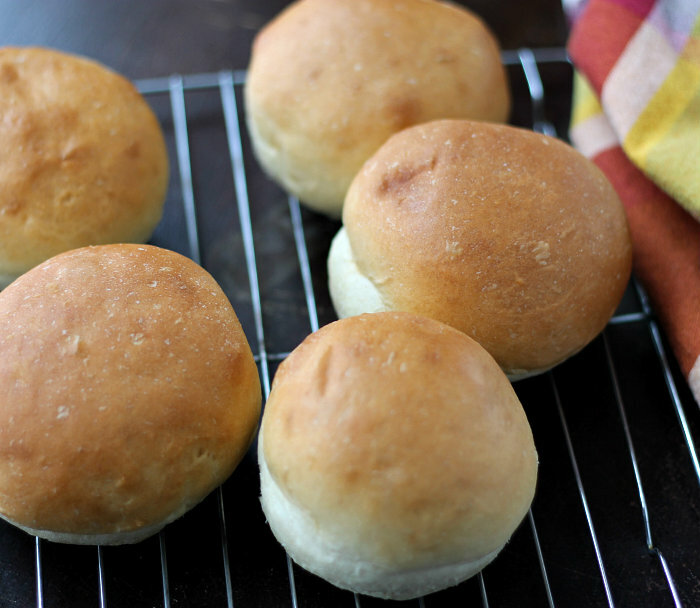 One’s own hamburger buns are so good — better than store bought for sure. These look excellent — thanks. Aw man! 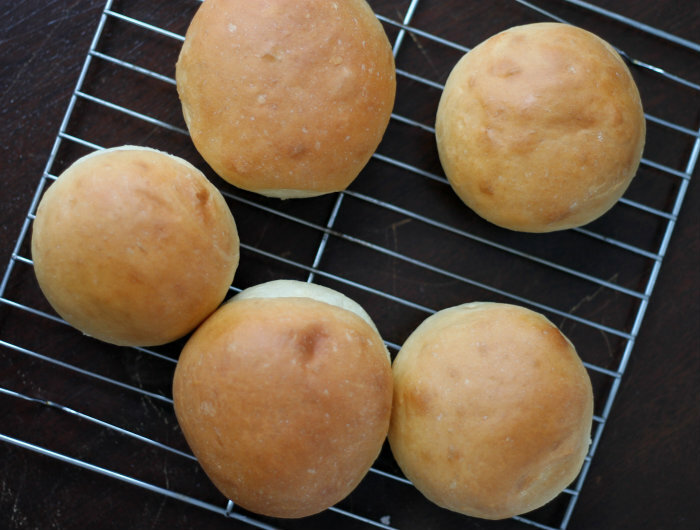 I remember when I was younger, my dad would always buy those luscious white flour burger buns for BBQs and I would sneak into the fridge and eat two of them prior to the BBQ…. And we would be SHORT buns! ha ah! Wow! You make your own hamburger buns. I guess I’m not ambitious enough to do that but I bet it takes the hamburger to an entirely new level. I hear you with the cold. I am in Boston and am pretty sick of the 7 feet + mounds of snow we have (on the positive side. . . it makes for humorous moments watching the dog fall into them).